What’s the best way to adopt a new daily habit? This year, I am throwing away any thoughts or talk of making New Year Resolutions. Instead I am taking the approach that to build a better life for myself, I will change one month at a time. Will you join me? I was talking to my business coach earlier in the week about how I was finding it difficult to make time every day to do my core and strength training. I quickly realised in our conversation that it is not about me ‘making’ time, it’s about ‘taking’ time, it’s about adopting a new habit into my daily routine. Like any good coach, she asked me, what could you do to adopt your new daily habit. My first answer “just do it”; my second answer “write it in my diary”; thirdly “I could do it for 30 days throughout January and then on the 31st, treat myself as a reward”; and finally “find an accountability buddy”. Well that got me to thinking … what if I combined the “30 days” and the “accountability buddy”. What if I had 100 accountability buddies? What if I forget all about New Year Resolutions and just focus on doing my core exercises every day for 30 days with somebody (lots of somebodies), holding me accountable. And to keep my motivation going, how about if I promise myself a treat at the end of the 30 days. To be honest, I was a bit nervous about setting up a #30DayChallenge. As if I haven’t got enough on my plate already with planning for The Confident Mother online conference and book. However when a couple of running friends mentioned on Facebook that they need a 30 Day Challenge to keep going … well, I thought, this is the Universe telling me to JUST DO IT. Tentatively I suggested they join me in my #30DayChallenge and they said “Yes”. So here I am … busy setting up a sign-up form and welcome emails. Maybe you were already thinking ahead to setting New Year Resolutions? Well we know that these tend to last less than a week. What surprised me is that, in one study looking at two week resolutions, those who relied on just willpower failed within a week. Interestingly, 30% of women stuck it out compared to 37% of men. Additionally, you are MUCH more likely to succeed when you tell your friends and family. In other words, when you have accountability and support. In my #30DayChallenge, I will provide accountability and support in a few different ways. Firstly I encourage you to tell your friends and family about the new habit that you want to adopt. I will send you daily emails to nurture and inspire you as you move towards adopting your new habit. I will share motivational tips and reminders. I ask you to share your successes and challenges on my Facebook page or Twitter. When you decide on what new habit you want to adopt, it is super important that you adopt the right habit. Maybe you’re thinking to yourself “I already know what habit I want to adopt”. But is it the RIGHT habit? In order to adopt a new habit, or to achieve any goal, it has to be something that you really really want. You need to know how amazing it’s going to feel when you have achieved it. You need to really see the value and the benefit of this new habit. If it does not tempt you or excite you, then quite honestly you will fall down on about Day 5 or 6. We all know how long New Year Resolutions tend to last. Secondly, before you start, you need to give your unconscious mind a very firm and clear instruction that you will adopt this new habit. As my good friend Caroline says “Be specific and authoritative about what you want”. Use a system. Quite often people fail with a new habit because they do not approach the change systematically. For example, a friend I know made a New Year Resolution she was going to eat more fruit every day. Eating fresh fruit and vegetables on a daily basis is a healthy habit to adopt. However she failed after about 3 or 4 days because she had no clear plan or system in place. She talked to me about this several weeks after her “failure”. As we chatted, she realised where she had gone wrong. She worked out for herself that if she had been more specific and if she had known ‘when’ she would fit it into her daily routine, she would be much more likely to succeed. So her new habit was to “Eat a piece of fruit at lunch every day”. She found it much easier to adopt the habit this time because she had a routine or an anchor to attach her new habit to. She ate lunch routinely every day … she simply attached her new “eat a piece of fruit” habit to her lunchtime habit. Adopting a new habit can seem somewhat overwhelming and difficult. By breaking it down into smaller steps you are making it more manageable, hence my suggestion to build a better life for yourself one month at a time. 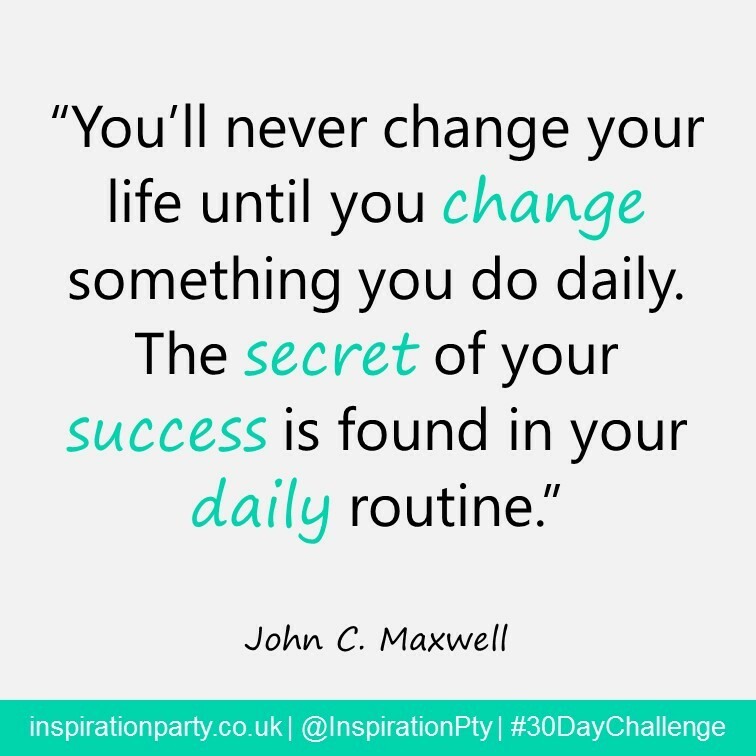 Adopt a new habit into your daily routine for 30 days, and you are one step closer to the better life that you want. Added to that, if you include milestones and rewards, you are far more likely to succeed. You could give yourself a small reward after 1 week, or after 15 days or at the end. Do remember though, if at any time you have a setback – and you may well do – just accept that you are only human, and simply get right back on track. Don’t wait for next week or next January. Just get started again. You might be curious by now about the new habit that I am adopting. My new habit is to do my 15 minute core & strength exercises every day when first I get up. It’s important to me because core strength is an essential element of getting fit for the London Marathon on 26 April. It is especially important right now as currently I am injured so I want to do everything in my power to recover quickly and prevent further injuries when I get back running again. I will reward myself at the end of the 30 days by spending my Christmas money to buy a photography course. If you want to join my #30DayChallenge, simply sign up here. If you want your family and friends to succeed too, please do share. I wish you every success in your #30DayChallenge. Thanks so much for sharing your ideas about changing a habit. That’s fantastic to give up smoking. I know that’s really hard. Great tips Sherry. I wish you success in getting fit again. My habit is a revitalised gratitude journal for which I have motivated myself by joining the blogging Gratitude Circle.